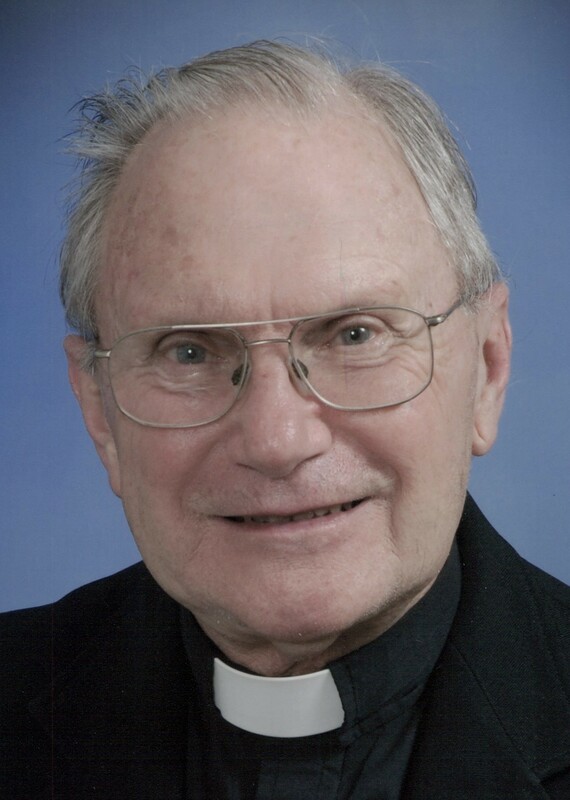 Father Stanley Osborne passed into his eternal life on July 17,2018 Stanley faithfully served as a priest in the Archdiocese of Louisville for 59 plus years. He was born in Louisville January 12, 1933 to Francis D. and Hallie M. Osborne. He graduated from St. George Catholic grade School, and Flaget High School. He completed his preparation for his mission in life at St Mary’s Seminary in Kentucky and St Meinrad major Seminary in Indiana. His ordination to the priesthood was at the Cathedral of the Assumption Louisville KY on May 23rd 1959. In his priesthood, he served the following Kentucky parishes: St. John Vianney Louisville St. Helens Louisville, St Peter and Paul Danville along with St. Mary Perryville, St. James Elizabethtown, St. Andrew’s Harrodsburg along with St. Lawrence Lawrenceburg, St. Edwards Jeffersontown, St. Vincent DePaul New Hope along with St. Ann Howardstown, St. John the Baptist Rineyville along with St. Ambrose Cecilia, in retirement Senior Associate St. James Elizabethtown and he served lovingly at Nazareth Home where he was in residence for the past (nearly) five years. He also worked with the Deaf for many years and was a Hospital Chaplin at Hardin Memorial Hospital Elizabethtown. Stanley’s sole mission in life was to be a good servant and to be a good priest to the members of the many parishes he had been assigned. He continued this ministry at Nazareth Home where he was a resident. He was an avid reader, with an inquiring mind and he was always exploring the true meaning of our lives. In spite of his major health problems over the years, he was resolved to complete his life mission during his time on this earth. At Nazareth, when he was able, he always attended the daily mass and encouraged others to join with the members who met each evening to pray the rosary. Of course, Stanley liked the food in the main dining room and the lunch conversations there with his friends. He enjoyed the privilege of being with all the residents of Nazareth Home, playing scrabble, chess, and other mind testing activities. He looked forward to the therapy sessions and the group exercise classes. He received satisfaction from the meetings with his Psychological/Theological book study group. When able, he loved meeting with the residents for all the Nazareth activities including playing bingo.. Stanley was preceded in death by his parents: Francis D. and Hallie M. Osborne, his sisters: Dora M. Ray and Corinne O. Bach and his brother Bernard E. Osborne. He is survived by his brothers: Edward L. Osborne (Sue), John T. Osborne (Barbara), and Richard F. Osborne (Betty), and many nieces and nephews. The family wishes to express thanks to Nazareth Home for the many considerations the staff and the residents have lovingly given to him over the years. A special thanks to all the members of St. John the Baptist Catholic Church for the memories they have joyously given to Stanley since he became a member of St. John’s parish in 1992. He will be missed by all. Visitation at Nazareth Home 1:00 PM to 3:00 PM on July 20th. Also on July 20th, visitation the church at St. John the Baptist in Rineyville Ky. at 5:00 PM to 8:00 PM . His funeral mass will be at 11.00 AM July 21st at St. John the Baptist Catholic Church in Rineyville KY. The graveside burial services in the St. John’s church cemetery to immediately follow. Donations in his memory may be made to Nazareth Home for Religious and Social Programs. No flowers please. Arrangements : The Louisville Ratterman Family Funeral Home Louisville KY and The Brown Funeral Home Elizabethtown KY.